The defence of the Titans needs to fire in tonight's must-win situation. In the first of the Inter-zone Wildcard matches of PKL 2018, Puneri Paltan takes on the Telugu Titans at the Netaji Subhash Chandra Bose Indoor Stadium in Kolkata today, Friday at 9 pm IST. Puneri Paltan is coming off a 23-36 defeat against the Jaipur Pink Panthers as their defence could score just 9 tackle points vis-a-vis the Pink Panthers' 17 points. Pune's team has been in continuous turmoil since the injury to Nitin Tomar. With a myriad of team combinations tried, none seem to give them the consistent results that they needed to get through to the playoffs. Now with no chance to qualify for the playoffs, the Paltan should give their all against the Telugu Titans to regain their pride. The Titans are also coming off a 28-44 defeat against the Bengaluru Bulls, as their defence failed to stop the rampage of the Bulls' raiders. One of the strongest teams on paper, with the likes of Rahul Chaudhari, Nilesh Salunke, Abozar Mighani and Vishal Bhardwaj in the side, the Titans have failed to string together a series of wins to assure themselves a place in the playoffs. With 2 matches to go, the Titans need to win them both and hope that the results do not favour either the Patna Pirates or the Bengal Warriors, in order to ensure their spot in the playoffs. 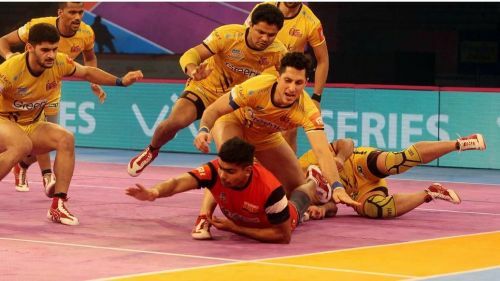 The two teams, Puneri Paltan and Telugu Titans, have faced each once before in the season, in Match 60, where the Titans won the encounter with a 28-25 scoreline. When and where to watch: 21:00 IST on the Star Sports network and on digital streaming platform Hotstar.